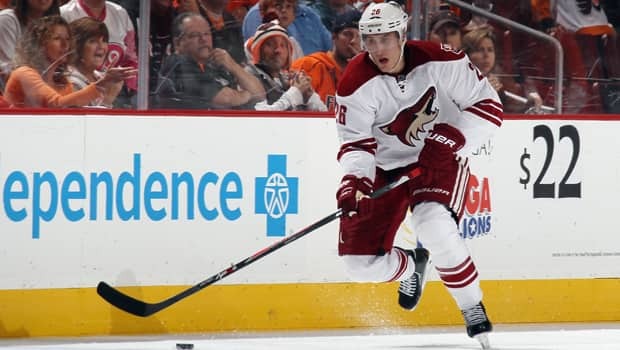 The season has turned eight weeks old and there is the 23-year-old Mike Stone of the Phoenix Coyotes with seven goals in 18 games. How many of you thought he would have that many goals playing behind Oliver Ekman-Larsson and Keith Yandle? A few seasons from now, it will be interesting to see Mike Stone's progression. Will we see the name of the unheralded Phoenix Coyotes defencemen still among the current league leaders in goals scored by blue-liners? The 2013-14 season has turned eight weeks old and here is the 23-year-old Stone with seven goals in 18 games. How many of you thought he would have that many goals playing behind Oliver Ekman-Larsson and Keith Yandle? How many of you thought the native of Winnipeg would be tied with Shea Weber, Erik Karlsson and Torey Krug for the goals-scored lead among NHL defencemen? How many of you selected Stone in your fantasy pool? "I'd like to have more points," said Stone, who has yet to register his first assist of the season. "But it's been really cool. "I just want to keep working hard and maybe one day I can get to the level of those guys." The son of Jackie and Rob Stone, and older brother of Ottawa Senators prospect Mark Stone, comes by his passion for hockey and scoring ability naturally. When the two younger brothers were younger, they spent countless hours taking shots on each other in the driveway of their Westwood neighbourhood home. "We had a long driveway and it was ideal for taking shots either with tennis balls or pucks," said Mike, who admitted the family's garage door had to be replaced a couple of times and that his parents weren't too pleased. "We would line them up and take shots for hours. "The great thing about Winnipeg is that we had a lot of snow and, by the time the plow would come around our street, the snow would be packed down. It was almost like ice - nice and slippery." Mike and Mark Stone shared their passion for hockey with their dad. He just happened to be a sportswriter for the Sault Star when Wayne Gretzky played his one and only full season of junior hockey for the 1977-78 Sault Ste. Marie Greyhounds. But that's only part of the story. When Rob Stone decided to leave life as a journalist for a career in the aerospace industry in Winnipeg, the void he left in the Sault Star sports department was filled by a young cub reporter by the name of Bob McKenzie. Yes, that Bob McKenzie, the guy from TSN. "My dad use to tell us that story all the time, but it was 'Yeah, okay," Mike said. "Then when I was 14, my dad and I went to Grand Forks [North Dakota] for the  world junior. "Bob was there and he picked my dad out of the crowd to say hi to us. I couldn't believe it." It was seven years later at the 2012 world junior tournament in Edmonton and Calgary that Canada fell in love with Mark Stone. The younger brother was on fire, scoring seven times in six games. "Like you said, I fell in love with him, too, at that tournament," said Mike, who scored 19 and 21 goals, respectively, in his final two junior seasons for the Calgary Hitmen. "I guess you could say that both of us love to score goals, probably from those days spent on the driveway." Mike is 25 months older than Mark. In junior, the two went head-to-head in successive WHL East finals with Mike's Calgary Hitmen beating Mark's Brandon Wheat Kings on both occasions. But after the Hitmen beat the Wheat Kings the second time, Brandon bounced back to beat Calgary in the 2010 Memorial Cup semifinal, only to lose to Taylor Hall and the Windsor Spitfires in the final. "When I played against my brother, it caused a lot of stress for my parents," Mike said. "We're both competitive and we both want to win. "But I felt bad after we beat his team and I know he felt bad for me when they beat us." Mike stands 6-foot-3 and 210 pounds, but is a humble giant. From afar, he texts his brother often and encourages him in his daily battles on the roster of the AHL Binghamton Senators. Mike also is quick to acknowledge the help he's had along the way. "There is no doubt I don't get this far if it wasn't for [Calgary Hitmen general manager] Kelly Kisio and [Hitmen head coach] Dave Lowry," Mike said. "It was junior hockey, but it was a professionally run franchise and they taught how to be a pro. "My assistant coach in the AHL, John Slaney, was a big help. He has so much experience and he taught me how to become a pro player. "With the Coyotes, assistant coach Jim Playfair has taught me to become consistent. We have a lot of leaders, but how can you not watch and learn from our captain Shane Doan? "If Doaner isn't the best captain in the league, he's certainly one of the best."